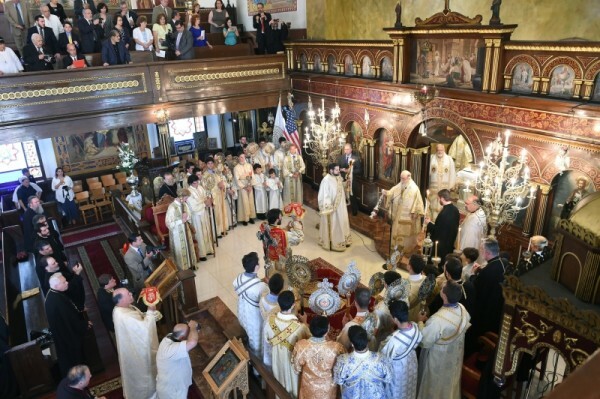 PHILADELPHIA, Jul 6, 2014 – The 42nd Biennial Clergy-Laity Congress of the Greek Orthodox Archdiocese of America began today with the Orthros service and Hierarchical Divine Liturgy held in the historic Greek Orthodox Cathedral of Saint George of Philadelphia with hundreds of faithful in attendance. His Eminence Archbishop Demetrios of America presided over the Divine Liturgy concelebrating with all the Metropolitans of the Holy Eparchial Synod of the Archdiocese. Taking part in the Liturgy were His Eminence Metropolitan Iakovos of Chicago, His Eminence Metropolitan Methodios of Boston, His Eminence Metropolitan Isaiah of Denver, His Eminence Metropolitan Alexios of Atlanta, His Eminence Metropolitan Nicholas of Detroit, His Eminence Metropolitan Savas of Pittsburgh, His Eminence Metropolitan Gerasimos of San Francisco, and His Eminence Metropolitan Evangelos of New Jersey, the host Metropolis of this year’s Congress. Representing the Ecumenical Patriarchate in this Congress were Metropolitan Stephanos of Kallioupolis and Madytos and Metropolitan Athenagoras of Belgium, who attended the Liturgy from the Solea. His Grace Bishop Sevastianos of Zela, the Chief Secretary of the Holy Eparchial Synod was in prayerful attendance in the altar. Assisting the Hierarchs were the Reverend Fathers Kosmas Karavelas and Nicholas Anctil, Archdeacon Panteleimon Papadopoulos and Dn. Philotheos Tomczewski. Just before the dismissal of the Liturgy, Archbishop Demetrios of America spoke to the hundreds of faithful who had filled the church. He thanked his brother hierarchs, the host, Metropolitan Evangelos and the Metropolitans representing His All Holiness Ecumenical Patriarch Bartholomew. The Archbishop, basing his homily on the Gospel reading of the day (Matthew 8:5-13), spoke about the “power of the word of Christ” and the faith displayed by the centurion in the Gospel reading. He said we should cultivate the same kind of faith in the power of His word and urged the congregation to take the opportunity of this Clergy-Laity gathering and “come closer to the power of Christ. Additionally, His Eminence, introduced those in attendance to the theme of this Clergy Laity Congress “The Orthodox Christian Family: a Dwelling of Christ and a Witness of His Gospel,” recognizing the vital connection of the family to God. At the conclusion of his homily the Archbishop asked the congregation to pray for the repose of the soul of Emanuel G. Demos, the General Legal Counsel of the Archdiocese for many years, who passed away Friday, July 4. His Eminence spoke of the long, invaluable and selfless contributions of Emanuel Demos, and followed these remarks with the chanting the Trisagion Service for the repose of his soul. Metropolitan Evangelos of New Jersey welcomed all the Hierarchs, the clergy and laity to the Metropolis of New Jersey and expressed his feelings of gratitude and honor to all the Hierarchs present, mentioning each one by name. Metropolitan Athenagoras of Belgium offered a greeting in English and Metropolitan Stephanos of Kallioupolis and Madytos in Greek. Later in the afternoon Archbishop Demetrios was joined by the Patriarchal representatives, the Metropolitans of the Holy Eparchial Synod and members of Leadership 100 including its Executive Director Paullete Poulos for the cutting of the ribbon at the official opening of the Congress Exhibit Hall. Leadership 100 is the underwriter for the exhibit area, which features numerous booths with vendors from the United States, Canada, Greece, and Cyprus and includes a ministry pavilion that highlights the national ministries of the Archdiocese. The National Forum of Greek Orthodox Church Musicians and the Order of St. Andrew – Archons of the Ecumenical Patriarchate held two separate and very well attended receptions for their membership and the Congress delegates. Congress information, reports, and programs are available at www.clergylaity.org.